While many anglers in New England are waiting for migratory saltwater species like striped bass and bluefish to return to area waters, now is the time to get out and get fishing in freshwater throughout the Neponset River Watershed, if you haven’t already. For many, the first fishing of the season means trout. Massachusetts Division of Fish and Wildlife has been hard at work since late March, stocking waters with varying sizes of brown, rainbow and brook trout. In the Neponset Watershed, there are a number of brooks and ponds that are stocked, for example in Canton, Medfield, Milton, Norwood, Sharon, and Westwood. The State provides a list of trout-stocked waters, as well as a schedule of stockings that gets updated weekly throughout the stocking season. This coldwater period also is a great time to catch warm water species like bass, pickerel, bluegill and yellow perch. My favorite species to target, this time of year, is largemouth bass. 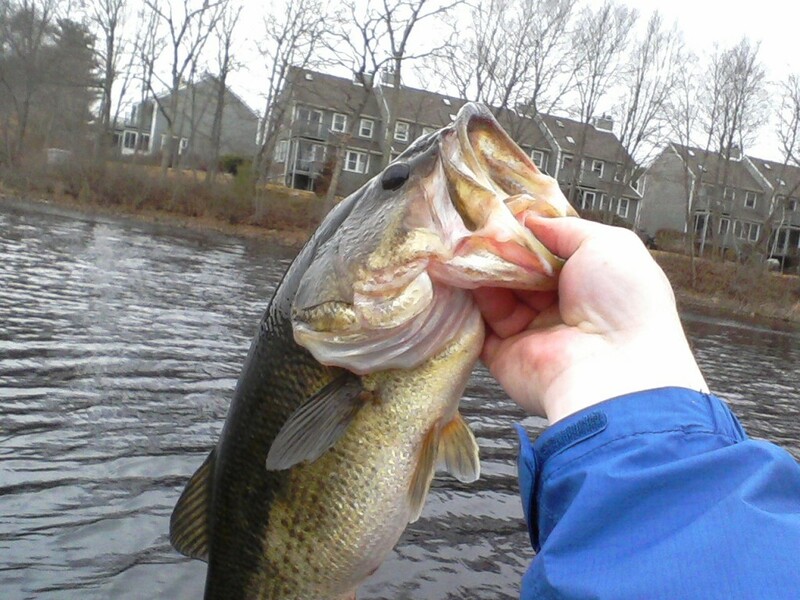 Often, you can find yourself alone on the water with an excellent chance at catching some of the biggest bass around. This, to me, is a win/win scenario. Solitude out on the water and the potential for great fishing. Some things to keep in mind when fishing for warm water species when water temperatures are still quite cold (40º-60ºF) is to go slowly. Sometimes, your lure or bait can’t move slowly enough to trigger a response from these cold-blooded critters. For bass, popular baits at this time of year are suspending jerk baits, spinnerbaits, and bass jigs. It is important to remember that, starting last year, all jigs under one ounce need to be made of something other than lead. As the weather warms and the days get longer, the opportunities to get out on the water keep getting better. There are a myriad of places in the Neponset Watershed to wet a line and try your luck. Hopefully, you are successful and don’t forget to take the time to enjoy not only the fishing but all the other wildlife you may encounter while you are out. Hi I’m trying look for some Native Brook Trout and White Sucker in the Neponset River on Neponset Street in Canton. Does that sound like a good fishing spot? There are plenty of white suckers all up and down the mainstem but the brook trout are small and mostly in the smaller tributaries.